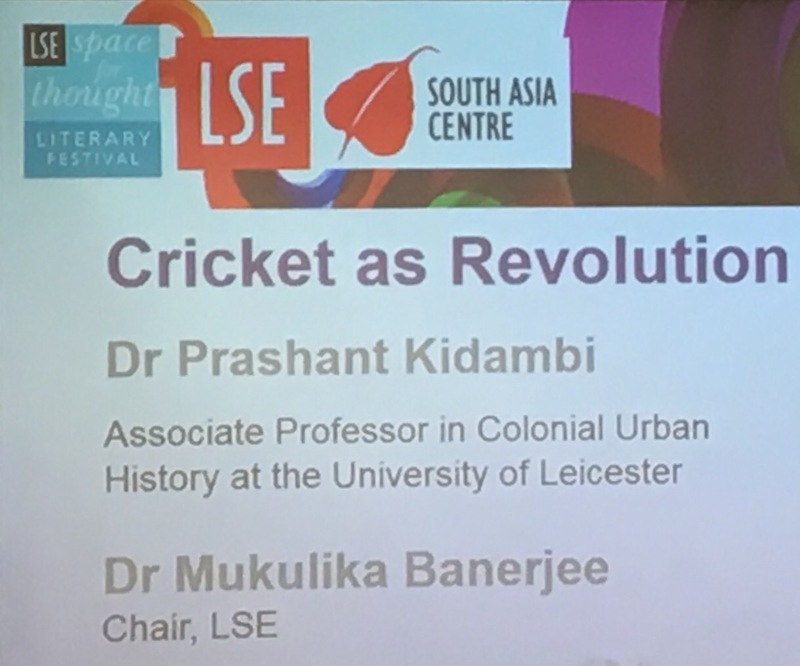 Yesterday I was fortunate enough to attend an excellent panel discussion on Cricket as Revolution organised by the LSE as part of its literary festival. The two speakers were Dr Prashant Kidambi of The University of Leicester and the journalist and cricket historian Peter Oborne. It was an excellent evening. Prashant kicked off with an unscripted 15 minute talk outlining the theoretical approach that he’s taking to a social history of Indian cricket that he’s researching now. His argument that the development of cricket is closed tied to the modernisation of Indian society in the twentieth century is one with which I agree wholeheartedly and whose grid of analysis (the rhetoric of equality on the field v quotidian bias on class/ethnic/caste lines, the role of mass media, the varying role of nationalism, and the role of class formation) could be applied across a range of sports in a range of territories. Against Prashant’s coolly analytical voice we then had Peter Oborne give a less coherent but more impassioned account of the role of cricket in the formation of Pakistani identity. His shoot from the lip style in the discussion afterwards was entertaining and entailed an unexpectedly enthusiastic digression on the development of women’s cricket in Pakistan. But I reckon his fondeness for straight talking (for example the comment, ‘Dubai is the most corrupt city on earth … with the possible exception of Bueno Aires’) may give something of a headache to whoever has to edit the discussion for podcast. But if it does go up on the LSE site I do recommend a listen. The open discussion ranged widely but focused more on present-day issues than historical events. Of course I’m interested in both but as a researcher I would have been interested more in the latter. The former I’d rather discuss in the pub or at the match. But it was good to see such enthusiasm for the game among the audience, and especially the stout defence of the Test game against the rise of T20. Prashant I’d first met when he examined me for my PhD and during that meeting he’d mentioned that he was working on a piece about the first all-Indian cricket tour of the UK in 1911. 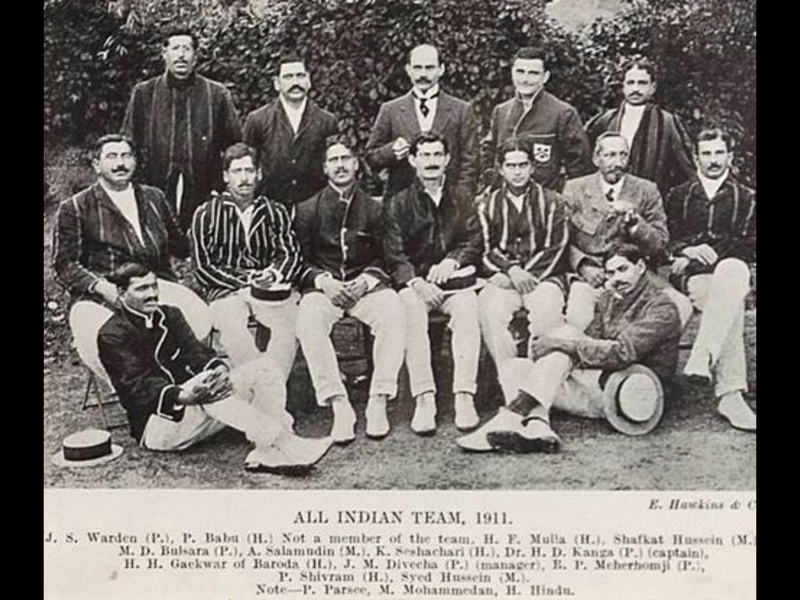 My thesis was largely concerned with the growth of international sport in the imperial context in the 1900s and I was aware that my own section on Indian cricket was weaker compared to some of my other material but Prashant was nice enough not to take me too much for task about it. So it’s now a pleasure to see that he has brought his work on the tour to fruition and his book should appear in the summer. Before then he will also give a paper at the Sport and Leisure history seminar series at the IHR on the subject which I’m very much looking forward to now that I’ve heard him speak, if only briefly, about it last night. By an odd coincidence I’d given a lecture on Indian cricket the day before in which, to put it simply, I outlined that contrary to traditional (i.e. white, Anglo, middle class) it wasn’t MCC that gave the game to the world, the world took the game from the English and developed it as best they could under colonial rule. Prashant can tell the story of the tour much better than I can so I urge you to either buy his book or come along to the seminar, which will be on 5th June 2017, if you’d like to hear more about it. Coming to review a restaurant when the intervening 48 hours have seen a bacchanalian 60th birthday party and a 6 hour police assisted face off with somebody with mental health issues (not mine (this time at least! )), one could be forgiven for not exactly remembering the details of the cuisine on Friday night. Especially as that occasion was an end of season cricket social that inevitably involved a real ale lead in of several hours. Fortunately my choice of dish at the trad Friday night Indian is as constant as the North Star. Taste of India is a blaze of light on the Drummond Street curry furlong and was selected over the excellent veggies to be found there to satisfy the carnivores amongst the team. We were a raucous-ish table of twelve but the service was remarkably good given the ‘confused’ state of some of us, and a fair amount of badinage going across the linen. I glanced at the couple next to us and felt a mild pang of pity for what they were about to have to listen to. We had a poppadom starter (two each), which came with a four piece chutney backing group. Well, they were fine but they didn’t last long. My stomachbrain was then wondering where the hell the onion bhaji was. But the jalfrezi arrived soon enough with good sized chicken bits and the refreshing blast of unmediated chilli. On the side was the usual carb overload – rice, aloo, naan – but also some good vegetable involving okra, cauliflower, mushrooms and other unspecified stuff which was at the other end of the table and beyond my arsedness to reach. Did we have coffee? I don’t think so. The Kingfishers were admirably chilled, the last dregs slipping down surprisingly well with a complimentary mint. Taste of India does what you want a traditional Indian to do and it does it well enough. Is it possible to write in August? When England make the most dramatic turnaround I’ve ever seen in an Ashes series? When the football season starts almost before it seemed to stop? When there is so much thing to do in London that you can’t walk across the street without stumbling into another festival? Well, sometimes you have to. In August I had a deadline to complete a chapter for an edited collection on South African cricket. * My chapter discusses the career of Percy Sherwell, the first player to captain South Africa on a tour of England in 1907 and the first player to captain South Africa to a win at home against a touring MCC side a few years earlier. ** My idea was to examine Sherwell, a largely forgotten figure nowadays, as a representative of the British South African community and the way in which his career as a businessman and sportsman was exemplary of the hyphenated existence of Anglo-South Africans. And that’s what it did. All I was interested in as a historian was Sherwell as symbol and I assembled my material and wrote the piece thinking I’d done a decent enough job from that point of view. It took one of my fellow authors to point out to me what a dunce I’d been (more politely than that it has to be said) in writing the piece for myself and not for the reader. The book after all is a book about South African history but it is also about cricket history. Any potential reader is likely to be interested in Sherwell as a man in the world as well as a symbol. They would want colour – what kind of a man was he? What other achievements did he have aside from the bare bones of his cricketing career? It wasn’t the first time I’d written a biography; last year I was asked to write a handful of entries for the Dictionary of Caribbean and Latin American Biography. Trying to encapsulate the achievements of Sir Vivian Richards on and off the pitch in less than a thousand words was something of a challenge (a vastly enjoyable one!) and not really what I would count as a proper biography of such a significant political and sporting figure. But having written those pieces and with Sherwell in my mind I started seeing biographies everywhere, especially in documentaries. A modern day Cutts would be very uncomfortable in our current times when it seems that every other documentary is about the early death of a musician. Kurt: Montage of Heck, Heaven Adores You and Amy are the standouts of recent years but I’m sure there are more. The common theme of these films is that their subjects had troubled personal lives and self-inflicted early deaths. I haven’t seen any of them. Of the three the one that I was most tempted to see was the Elliott Smith. I first started listening to him when I had no idea who he was, what his life was like or even that he’d appeared at the Oscars due to his having written a song that was included in Good Will Hunting (a film I’ve never seen). ***** As I bought more of his albums I learnt more about him but was only marginally interested in the factual tragedy – I was hungry for his artistic output. Tempted as I was to watch the biopic (I’m not sure if it’s on general release or has been on general release in the UK, I only came across it in an article in Le Monde) I didn’t seek it out. Why? For one thing, the kind of performance footage that a documentary can assemble, by contrast to the pre-YouTube era when you might be excited at seeing an alternative or live version of a song you’d only heard of in print, is there now at the end of your fingertips on your phone if you want it. It’s in your pocket and you don’t need an editor to slide it in between a talking head or muffle it with a voiceover telling you how so and so felt when they were there. Secondly, who are these documentaries for? Are they for people who love the music or for people who love the tragedy? I liked Winehouse’s music but I don’t believe I ever saw a second of her being interviewed or read a story about her in a newspaper. I had as little interest in her non-musical life as I do in any other troubled individual with whom I have no tangible relationship. Ditto with Cobain, a man who died when I was at sixth form and for whom, while he was alive, I had a pretty healthy contempt as a ‘voice of the generation.’ Having grown up (relatively) a little since then I realise that he didn’t ever claim to be such a figure and my teenage self was being a judgemental little prick who couldn’t tell the difference between the nonsense that the NME wrote about him and the sense that he himself wrote in his songs. I mistrust these biographies as being produced by people who wish to condemn the sources of pressure that made lives hell for their subjects while at the same time wallowing in the same screwed up mix of exploitative brand-building and rancid tragedy-hunting that first reared its head in my adult lifetime with the death of the Princess of Wales. Even cricket isn’t immune to such impulses. 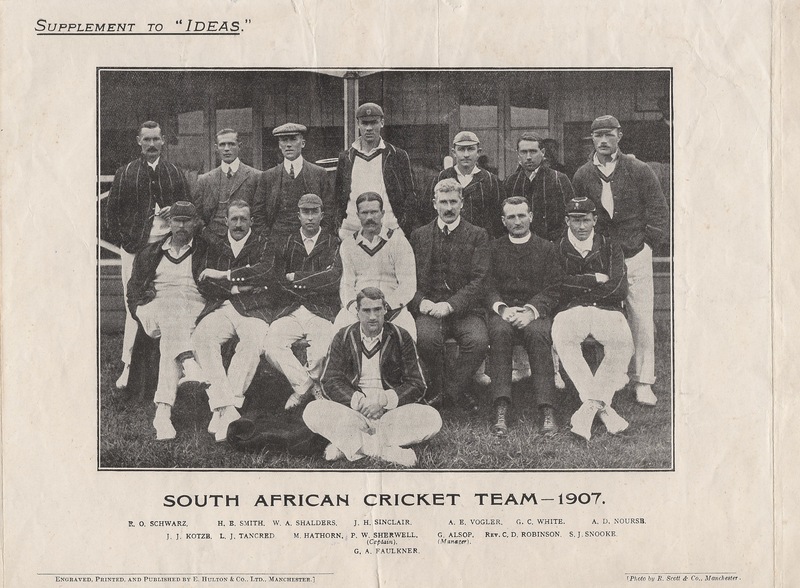 Of the men in the picture of the 1907 South Africans the most famous is probably Aubrey Faulkner, sitting at the bottom. Faulkner was a fine batsman, the finest South African batsman of his generation. His fame, however, largely lies in the manner of his suicide in 1930. David Frith, a usually reliable cricket writer, included his story in his book By His Own Hand: A Study of Cricketing Suicides. ****** The thesis that cricket as a sport is uniquely given to provoking suicide seems too slender to merit more than a newspaper article. To focus an entire book on such a study seems to privilege the private tragedy of the individuals concerned above their public performances on the pitch. So it was refreshing to go to an exhibition at the National Portrait Gallery this week that didn’t pretend to any great psychological depth or hint at personal tragedy. Audrey Hepburn: Portraits of an Icon, produced in collaboration with the film star’s family, is frank in its presentation of the surface rather than the depths of her life. It’s the kind of honest dishonesty that seems a more adult proposition than the dishonest ‘honesty’ of the music biopics. Hepburn’s image was tightly controlled from very early on – as a ballerina, as a model, as a minor English starlet, as a major asset of the Hollywood star system and finally as a woman in control of her own career and image. The exhibition joyfully lays out how the intersecting worlds of photography, film-making, fashion and PR combine to produce a figure, ‘Audrey Hepburn’, that is as much an outstanding artistic production as any song by Kurt, Elliott or Amy. Similarly, while I was happy to trace the movements of Sherwell around the Empire and note his performances as a cricketer I had no desire to find out if he kicked his dog, hit the bottle every night or slept with his neighbour’s wife. His interest for me as a historian lies in how he was presented as a role model of Anglo-South African manliness, and as a sports fan for how he thrillingly held his nerve to hit the winning runs in South Africa’s first win over England in 1906. As for those singers – why should I have some right to their personal sadness? I’d rather go to the extraordinary music they made and feel how they transformed their experience into a work of art that talks to me about the life around me now. Roddy Cutts had some sense. * All going well it is due to appear in 2015/16. It will be a successor to B. Murray and G. Vahed (Eds. ), Empire & Cricket: The South African Experience (UNISA: Pretoria, 2009). My own contribution to the first volume was something of an addendum to some excellent work by a range of cricket historians. ** Non-cricketers might not be aware that back in the day England tours were officially billed as tours by Marylebone Cricket Club with only the international or test matches being designated as England games. *** All writing should of course be at least mildly interesting; aspiring to entertain even when serious. ***** He doesn’t appear comfortable. In Wes Anderson’s Royal Tannenbaums his Needle in the Hay is used very effectively. I hear it and it sends a shiver down my spine at the intensity of the feeling that Smith communicates. The same way now as it did the first time I heard it by chance on the radio years and years ago. ****** David Frith, By HIs Own Hand: A Study of Cricketing Suicides (Stanley Paul: London, 1991). Ironically the foreword is by Peter Roebuck. This is a very cricket week. England had a magnificent victory at Sophia Gardens but I also managed to turn out for my local side, Archway Ladder CC on Wednesday and if selected will be playing for them again this evening. All this prior to going to Lord’s for the first day of the second Test against Australia. A very cricket week. To those not brought up in the culture of cricket, whether tourists visiting London or people living in the UK whose families had no interest in the game, I think it can seem a rather arcane activity that might be picturesque but isn’t necessarily very accessible. I realised this talking to the checkout woman in the supermarket this morning who, after I told her I’d been watching cricket all day yesterday, asked me who was playing and ‘didn’t they only play cricket in hot countries like India?’ Maddening!!! Such ignorance might explain this scene, which takes place every weekend in my local park over the summer. 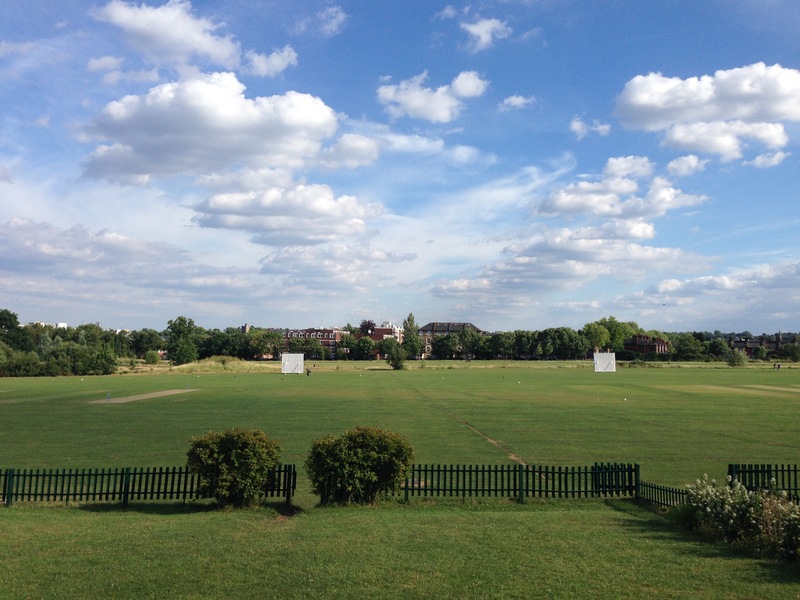 When I first moved to London around twenty years ago there were two serviceable cricket pitches on this patch of ground, each with a changing room and used regularly through the summer by local teams. Over the years the council first neglected the changing rooms, allowing them to be broken into and failing to repair them when they were, then neglected to maintain the pitches so that they became dangerous to play on, and finally dug a great trench across the playing square, thus ensuring that it was no longer fit for cricket. 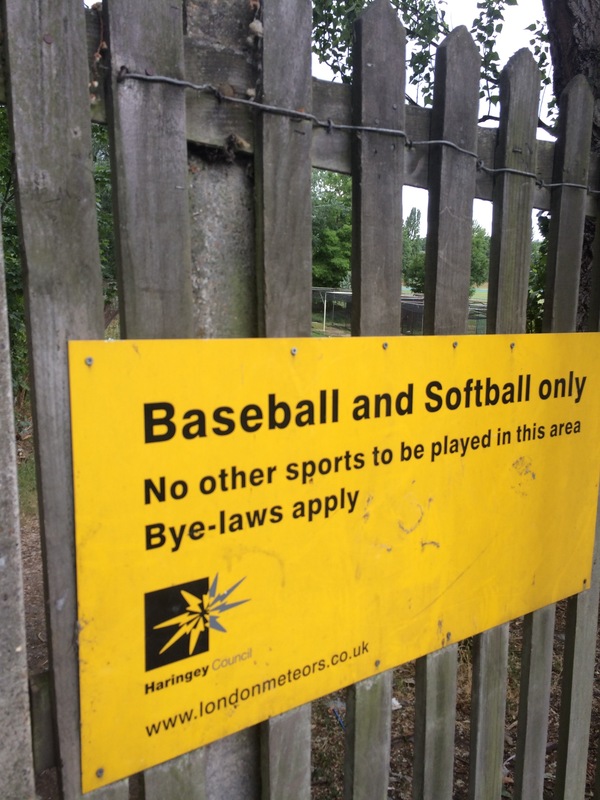 A sign by the gate says ‘BASEBALL AND SOFTBALL ONLY’. Through the bars you can see what used to be cricket nets. Don’t think we’ll ever get those back. Fortunately no-one takes this seriously and you get a lot of people using the space for football training or playing scratch cricket matches. 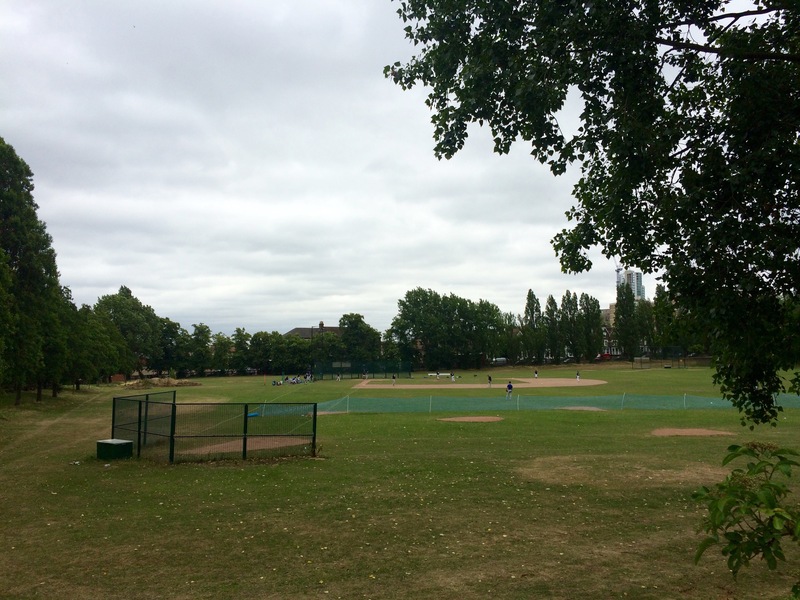 But still, one thing you can’t do in Finsbury Park is watch or play a proper cricket match. 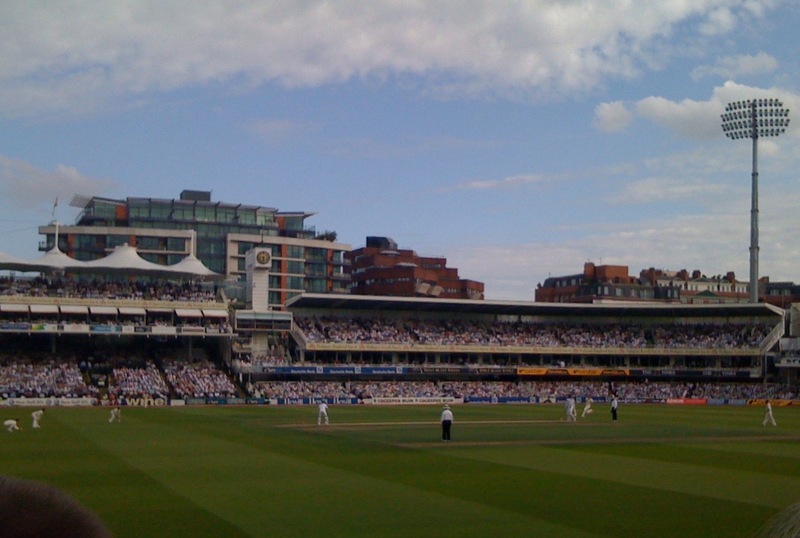 So if you do want to watch cricket in London where should you go? This is a small guide, based solely on my personal experience, for the uninitiated or the curious tourist. If you only ever go to one cricket match in your life I would recommend a Test match at Lord’s. Of course tickets for this week’s match against Australia will have sold out months ago, so you should start planning for next season if you intend to go. It’s expensive (110 GBP for Australia, usually 50 GBP plus for other teams depending on the level of their support in the UK and their box office appeal) but don’t let that put you off. Cricket lasts from breakfast until evening and while you’re allocated a seat you can also wander round the ground. This turns into a large village for the duration of the match with shops, food and drink stalls, a museum, games and activities for children and the big screen on the nursery for if you’ve temporarily mislaid your ability to rise from the horizontal. I like the atmosphere in the nursery, especially in the late afternoon when the crowd turns amiably sloshed. Watching from your seat is better, especially if you’ve remembered to take your own supplies of food and drink to mitigate the eye-watering prices at the bar. 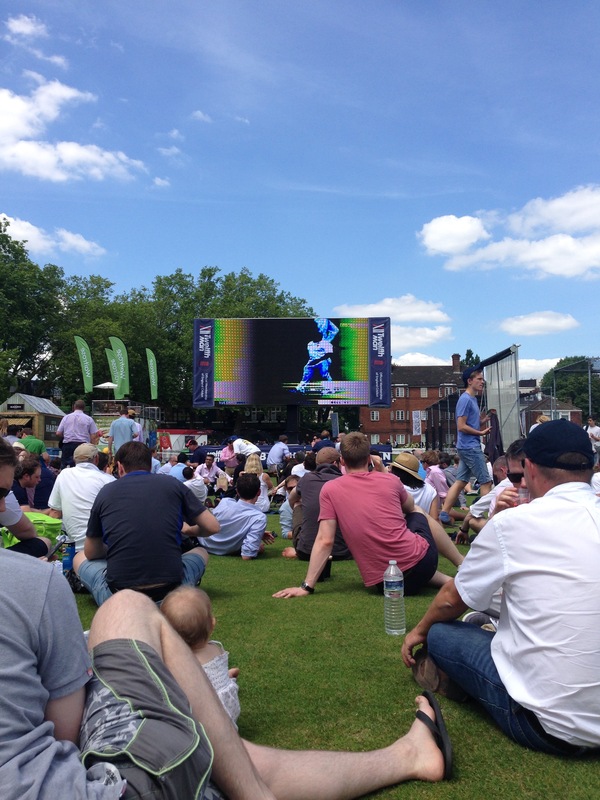 The crowd for a Test match is knowledgable, generally good-humoured with opposition fans and has a happy mixture of people of different genders, ethnicities and social backgrounds. The ‘buzz’ you hear as a bowler runs in for the first ball of the day is a sound worthy of inclusion in Desert Island Discs. 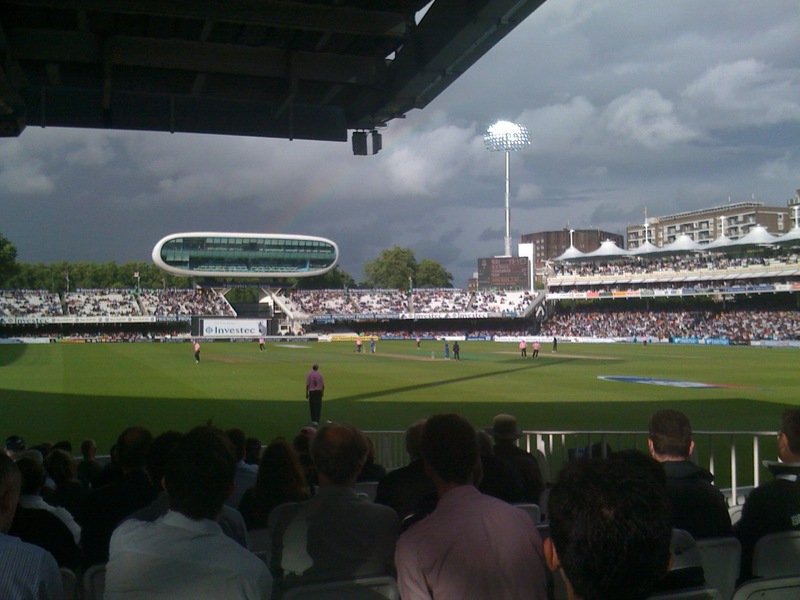 A Yorkshire friend says he ‘doesn’t do Lord’s’ because of it’s perceived/actual air of social exclusivity. This is true of the pavilion, of which more later, but is easily ignored and shouldn’t deter anybody from visiting this wonderful ground. Not often sentimental or nostalgic I nevertheless feel a sense of deep history when walking through the Grace Gates on match day. This romanticism is only enhanced by the welcome guilty sensation of cracking open a bottle of wine before lunch. It makes me feel like an 18th century rake. For the uninitiated it is probably the most accessible version of the sport (it was designed for that purpose) and theoretically is a glitzy wham-bam festival of cricket that’s over in 3 hours rather than 5 days. So yes, at Lord’s you get loud music over the sound system, dancing cheerleaders, coloured clothing (although what is inherently more exciting about a pair of red trousers than a pair of white ones is something of a mystery to me) and the players lounging on the field. In other words it was designed to attract children of all ages. I’ve reported on some T20 matches and I can’t remember the results of them or any event of interest … in a game where too much is happening all the time it soon becomes apparent that very little is happening of any consequence. Sixes rain down, badly made up ladies jump up and down and the crowd endures another round of ‘Another one bites the dust’. Twenty20 at Lord’s, Middlesex v Rajasthan Royals. Impending rain. Nevertheless T20 has increased attendance and I wouldn’t be churl enough not to celebrate that. It is a good thing to do after work in the company of a few mates or family. This really should be the game for the cricketing neophyte. Starting at lunchtime and finishing in the early evening you get to see a result (should the weather not intervene) in a much less frenetic atmosphere than T20. Take a picnic, get a row of seats and lounge your way through a sunny Sunday. Batsmen will still play expansively but bowlers get more time to work at them. The more relaxed rhythm of the 40-over game will also allow you to take a stroll round the ground from time to time without missing anything. My favourite, non-Test form of the game. Crowds are pretty healthy on a good day and I’ve rarely come out feeling less happy than when I went in. Even when Middlesex lose. 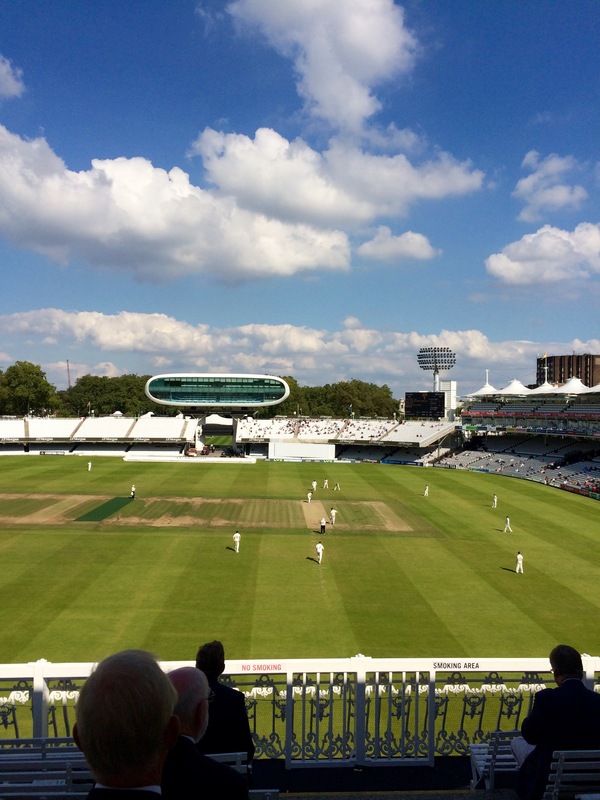 Lord’s for a county game, from the pavilion. The purist’s form. Four day matches going from 11 till 6.30 in the evening. I’ve never attended the entirety of a championship match but sincerely hope to devote a substantial portion of my retirement to doing so. You can wallow in four day cricket; you can do the crossword, write a novel, sleep soundly, talk to the players, heckle the players, heckle the crowd, drink beer slowly, eat food slowly, catch up on your emails, do some birdwatching, think about the futility of life and the absurdity of not having a choice about being born, contemplate entering a religious order, plot the foul murder of your enemies, look at a sparrow once killed by a cricket ball, grow a fine beard, compose poetry, stab your own knee with a pencil to make sure that you’re still sentient, listen to Lancastrians singing ‘Oh, lancy lancy! Lancy lancy lancy lancy lancashire’ like drunken sailors, get divorced and remarried, scratch your own hay-fevered eyes out for fun, make friends with improbable people, bear grudges towards the unaware, flirt with a barmaid, flirt with a barman, get short-changed, be bought drinks by a generous stranger, lose money hand over fist, listen in to seedy conversations, admire the boundless enthusiasm of cherubic children, be curmudgeonly to a fault, go home. If you take out a membership you upgrade this experience to encompass The Pavilion. Here you find beasts that not even medieval European mapmakers had the creativity to contemplate as existing in yet ‘undiscovered’ areas of the earth. Things in improbable outfits (although always conforming to the dress code) with hideous facial hair and loud barking voices. But every one of them a sound chap. Wrap yourself in an air of insouciance at such eccentricity and enjoy the deep comfort of the greatest place for watching sport in the world. I haven’t been fortunate enough to go to a women’s international as yet but I have been to a county game (many years ago). The women’s game has all the skills and pleasure of the men’s. Visit my friend Raf’s blog for a far more knowledgable advocate of the game. Looking over the illustrations in this post I realise that there’s one thing that I watch at all forms of the game and that is the sky over England. The sky is the protean witness to all this toilsome play and it never disappoints as a backdrop to the game. Constable, I’m sure, must have been a cricket-lover. * I must emphasise that I am not anti-baseball. One of the best evenings of my life was watching baseball in Oakland and falling in love with the game. But that was in California, not north London. *** Surrey play their cricket at the Oval but I’ve only ever used the nets there so won’t comment on the viewing experience. **** Although this week I varied my repertoire by being out stumped for the first time in my ‘career’.